HomeNewsA WEEKEND IN THE GARDENS- NEW CONCERT EVENT FOR MELBOURNE’S FAVOURITE BOTANIC GARDEN! A WEEKEND IN THE GARDENS- NEW CONCERT EVENT FOR MELBOURNE’S FAVOURITE BOTANIC GARDEN! Melbourne’s iconic Royal Botanic Gardens is set to come alive with music with the announcement today of a brand new concert event beginning next year – A WEEKEND In The Gardens. Developed by the team behind the highly successful A Day On The Green winery series, A WEEKEND In The Gardens’ inaugural event will take place on the March Long Weekend with three amazing concerts on Friday March 10, Saturday March 11 and Sunday March 12. A WEEKEND In The Gardens is all about bringing music lovers to the Gardens to enjoy the beautiful environment on a summer’s night while experiencing great live entertainment. A much-loved and iconic Melbourne location like the Royal Botanic Gardens needs a much-loved and iconic performer to launch the very first event. And that can only be John Farnham! John is thrilled to be headlining the opening concert on Friday March 10. He will be joined by two more of Melbourne’s favourite sons – Daryl Braithwaite and Ross Wilson. We couldn’t think of three better local legends than John, Daryl and Ross to kick off this stellar new event. 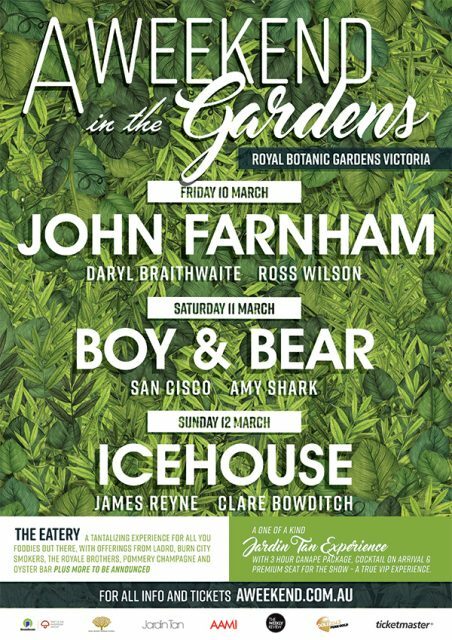 On Saturday night, a younger audience is invited to the Gardens with the wonderful Boy & Bear heading up a line-up featuring San Cisco and Amy Shark. On Sunday night ICEHOUSE continue their 40th anniversary celebrations, with acclaimed singer/song-writers James Reyne and Clare Bowditch. After three fantastic nights of music, it’s highly appropriate that Monday March 13 is a Public Holiday in Melbourne – hello recovery day! A WEEKEND In the Gardens is far more than just the music. To enjoy this special location, a major feature of the event will be “The Eatery” – an area adjoining the site with a variety of high quality food and drink stalls where patrons can chill out in a relaxed and vibrant space. Foodies will be tantalised with offerings from Ladro, Burn City Smokers, The Royale Brothers and Pommery Champagne & Oyster Bar to name a few! A WEEKEND In The Gardens is also pleased to have the Gardens’ acclaimed Jardin Tan restaurant join this special event. Located immediately behind the concert area, Jardin Tan will offer a VIP Canapes package. With its central location, A WEEKEND In The Gardens is sure to be a warmly welcomed by music lovers and to become a highly-anticipated event on the Melbourne concert calendar. For full event details, go to www.aweekend.com.au.